[Sony Ericsson] said it shipped 10.5 million units in the quarter, a 28 percent decrease compared with the same three months in 2009. It was down from the 14.6 million units shipped in the fourth quarter. via Mobile phone maker Sony Ericsson posts Q1 profit – Yahoo! News. A few weeks ago RIM said it shipped 10.5 million devices. 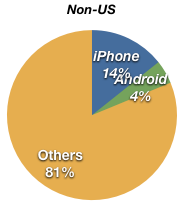 With Apple claiming 85 million installed base of iPhones and iPod touches vs. 75 million last quarter, it’s safe to assume at least 10 million Apple smart devices shipped in Q1. 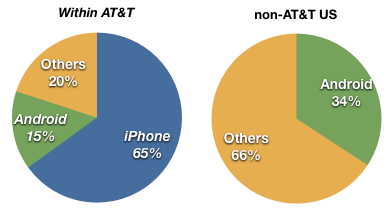 By units at least, SEMC, RIM and Apple are neck and neck.